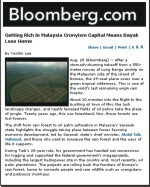 While Taib Mahmud used his BN party convention (staged at the new Borneo Convention Centre, which he corruptly hired his own family to build and manage) to lash out at the ”liars and cowards”, who dare criticise his policies of ’progress and development’, Sarawak Report took receipt of a tape, some interviews and photographs. 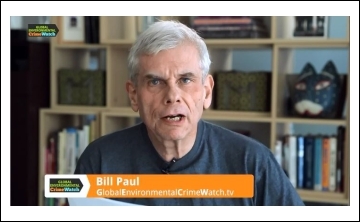 The material shows the scavengers who scrounge their living out of the re-cycling dump in the car park of his own Borneo Development Corporation! The scenes take place every day just 150 meters from the office of his political secretary Karim Hamza, who also enjoys the job as Chairman of the BDC. Sarawak is Malaysia’s richest state and has a small population. Billions have been raided from the jungles and from oil and all this wealth is plainly reflected in the vast homes and wealth of the Taib family and theirbusiness associates. However, it is clear that sharing some of this wealth with the people he took it from is not part of that policy of ‘progress and development’, for which Taib so loudly refuses to apologise. We have learnt that many of these scavengers, who wait to crowd around the cars drivers who come to dump their old and broken things, have come from the Stampin Resettlement Scheme – they had been promised a better future by BN, but as so often, the promises turned out not to be straightforward. Each tiny plot costs RM 10,000 and if the settler cannot pay it they cannot claim title to the land, even if they have shouldered the cost of building a house. This swamp land also needs earth filling to be suitable to build on and this costs another RM 8,000 for the impoverished natives, making ‘resettlement’ even harder to achieve. Most of these low-paid or un-paid settlers have no hope of meeting such costs. As the Chief Minister sets out to destroy even more of the country with his new mega-industrial ‘development’ programme, SCORE, the half million further natives who are threatened with displacement as a result should consider these scenes, which show their fellow people who suffered first. Of course, such petty problems, which affect so many thousands of natives who have been displaced from their lands by ‘development’, appear to be beneath the attention of Taib Mahmud, who arrived at the convention in his customary Rolls Royce. Even less so his politician son Rahman, his once rumoured successor, who was too busy enjoying his skiing and jet-set lifestyle (according to his facebook) to bother to turn up at all. However, Sarawak Report thinks it is appropriate to report some of the stories of anguish behind the stampede as each car arrives at the dump, especially during the week of International Womens’ Day. 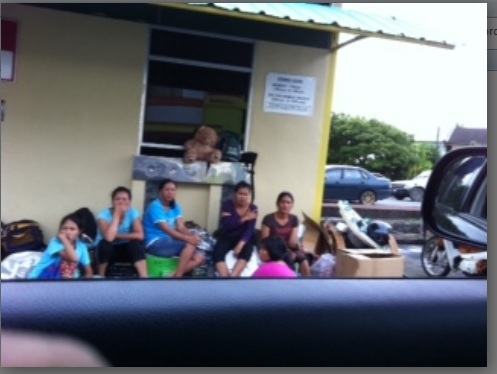 We however do think it is worth investigating the human stories behind the mainly women who are waiting at the dumps all over Kuching. 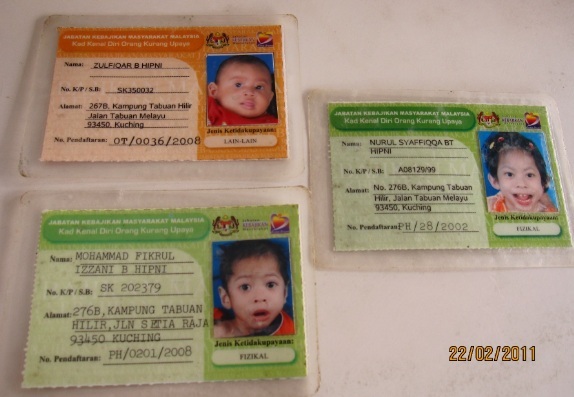 Nuratiqah binti Abdullah told us she is 34 years old and has three children aged 8, 9 and 15. 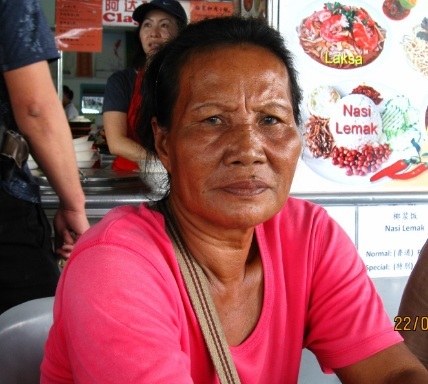 Her family lives in resettlement area but on land without a Temporary Occupation License. 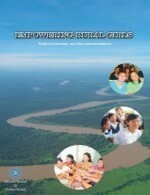 Therefore she is unable to access basic utilities such as water and electricity. At night, her house is lighted up with only one bulb running from a car battery. The home was partially damaged when fire broke out 3 weeks ago. The children’s school uniforms were lost in the fire. Her husband is jobless and occasionally joins her at the recycling centre. Invalid father-in-law lives together with them. 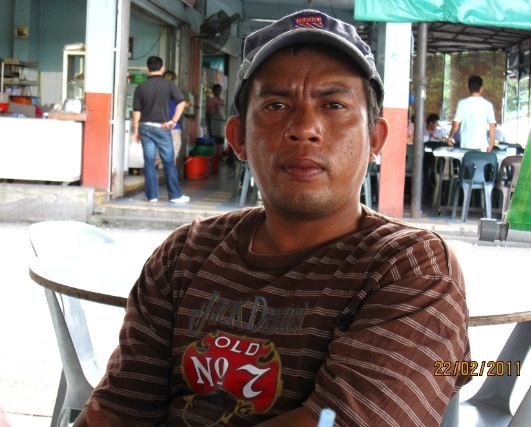 He receives RM150 in welfare monthly. Nanong binti Sidek is aged 37. She lives within the resettlement scheme. Her dependents are two young children; son 12 years, daughter 9 years, for which she receives RM200 in child welfare support monthly. Her husband deserted the family 4 years ago. She lives with an aged father, who suffers from diabetes and heart ailments. She formerly worked as waitress in a coffeeshop, but was unable to withstand constant scolding by employer. She has been scavenging since 2008. Kiat anak Resat is 69 years old. 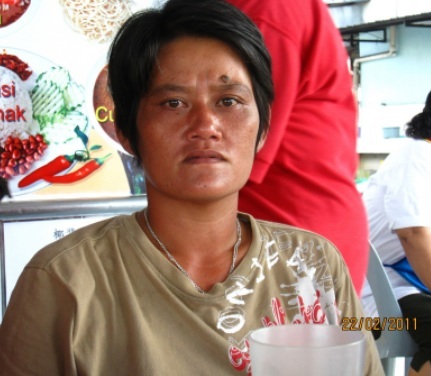 She too resides in Kampung Stutong Baru, which forms part of the Stampin Resettlement Scheme. The resettlement scheme itself is made up of 1154 lots of land. She formerly worked at a construction site for 6 years before she took to scavenging for the last 4 years. Her husband is wheelchair bound due to a stroke, for which they used to receive welfare of RM60 per month for 2 years until it stopped. She has 5 grown up children; her 3 sons have no fixed income (one is an alcoholic), her 2 daughters are already married with families and contribute little support. Down the road from the dump can be found some of Kuching’s wealthiest developments. Taib’s other son Abu Bekir’s apartment at Village Grove is about 300 meters away and he must pass them every day. Abu Bekir’s fabulous wealth is un-earnt, because it came in state hand-outs in the form of contracts and concessions given by his Dad. However, the old man clearly does not believe in extending such generosity to the mothers and old women who are suffering in his resettlement schemes. They are expected to pay impossible sums to take advantage of the housing schemes advertised by BN as opportunities for the poor. Betty anak Gelangyan is 22 years old and the newest to the group. She is also from Kampung Stutong Baru. Her mother is 43 years old and unable to work as she suffers from epilepsy, for which she received welfare of RM70 per month for 2 years before it stopped. 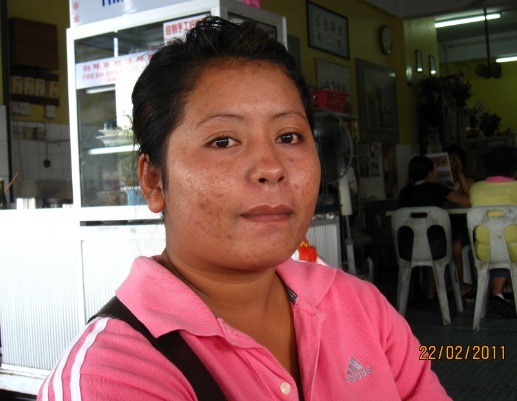 Betty works in coffeeshop RM400 per month to support her family and a 19 years old school-going sibling. To try and supplement their income she started scavenging 4 months ago. Our source told us that according to the ladies, although they keep some of the salvaged items for personal use, they also try to use it to barter for foodstuff such as rice with the neighbours or with the local grocery shop where they live. As they do not own transportation, they travel to the recycling centre in Borneo Development Centre by bus, which is about 5kms from Kampung Stutong Baru. It is not believed that Taib referred to this form of ‘progress and development’ when he lectured his supporteres on launching “an all out battle” on the opposition, who are calling for more fairness in the distribution of Sarawak’s wealth. One male scavenger was Hipni bin Bahdi, who is 35 years old. Unlike the others, he lives in Kampung Tabuan Hilir. He has 4 children; 12 yrs, 6 yrs, 4 yrs and 3 yrs. The 3 youngest has neurological deficiencies. Arising from it, the 6 year old died in April last year. Receives RM300 monthly disability allowance for the children. Aside from his wife (34 years), he also supports his 64 year old mom and 28 year old brother who suffers from a hole-in-the-heart. Has a night job barbecueing Satay for RM25 a night. Aside from scavenging from the recycling centre in BDC, he also scavenges from another 3 locations as he owns a motorcycle; Kenyalang, Tabuan Laru and 3rd Mile. These are the people forgotten in the so-called 30 years of ‘progress and development’ by BN. 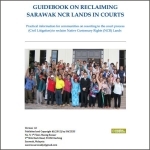 There are nearly 10,000 squatters in Sarawak and many more in resettlement schemes after losing their lands to ‘progress and development’. Nearly all have discovered that life in a resettlement is costly and hard and that there are huge expenses demanded by the government, but no jobs to pay for them. If Taib returns to office and starts rolling out SCORE, then many tens of thousands more Sarawakians will face the same disastrous fate as these squatters and re-settlers. However, as BN has failed to register three quarters of the people in so many of the areas that stand to be affected, these people will have no chance to vote one way or the other! His his speech Taib had the cheek to quote Abraham Lincoln on democracy, “Government of the people, by the people, for the people”. In fact, as everyone knows, Sarawak is governed by the Taibs and only for the Taibs and most other people don’t get a look in! I’m proud of these scavengers just to earn a dissent income out of what God Allah SWT permits them. But what an ashamed things to all the politicians in S’wak include thief minister Taib. They live wealthily at the expend of all the majority poor natives in the state. I’m also very much so sorry for the people of S’wak especially the groups from Sadong Jaya who’ve shown such a stupid and crab mentality by demanding thief minister Taib son Mohd Bekir to be their coming state election candidate for Sadong Jaya. God Allah SWT gives u all eyes and ears to see and hear what this thief minister Taib n family members and cronies have done to the rakyat of S’wak. Land grabb, logging here n there, palm oil plantations here n there that include part n partial of Sadong Jaya land in the interland of Sadong Jaya as in Sebuyau/Ensenggei, Kpg Melayu/Bangka Semong. What’re u people upto. Plz wake up n be very sensible in ur thinking. This is just a manifestation of hv BN/PBB hv done to Sadong Jaya. Ur the people who’ve said that their is no development in ur areas. Can’t u all talk with sense. Think…think…think. These scavengers do not put us to shame — they are earning an honest living, one that most of us look down upon. The people who put us to shame are the politicians, timber tycoons and plantation companies that stole the land and resources from us. This story is slightly too heavy on the rhetorical side. It tugs at the heartstring but left out alternative approach to poverty eradication. The story could have focussed on recurrent failure of resettlement scheme in Sarawak by exposing the underlying “corrupted” motive behind most of the resettlement scheme in the first place. It could have been more analytical into some depth and breath. Another intriguing perspective related to the same subject matter would be to dig out the underlying social behavior behind Sarawakian deep tolerance for bad government i.e one that seem happy to regurgitate GDP statistics but glossing over how meaningless the statistics would be for Sarawakian. It would be interesting to read actual interviews with ordinary Sarawakian from different walks of life on why they still support BN, follow by analysis of any emerging patterns by age,gender, rural/urban divide,race, and religion. 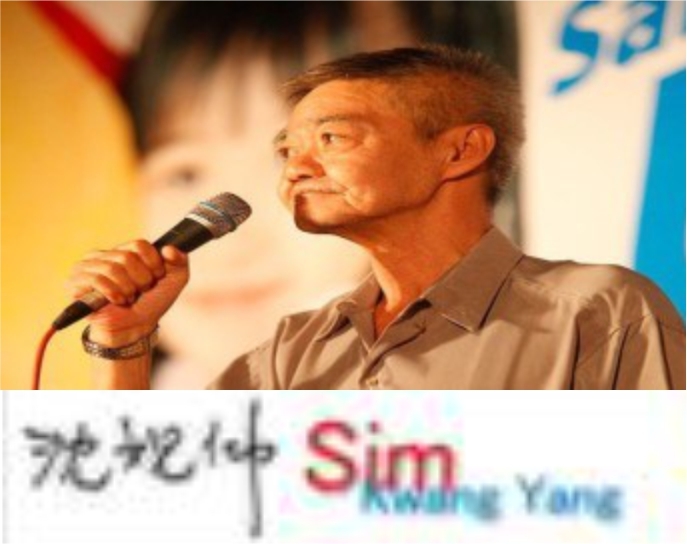 On an individual level: as poor and destitute are the scavengers, I won’t be surprise if they will still absent mindedly reply that they will vote BN – if asked ! Not only have the poor and destitute became materially poorer, they are brainwashed to be zombies – and like the baby elephant in Thailand, which have been abused to entertain the tourist and to be beast of burden, the poor have come to worship Taib and his cohorts – even in their sleep ! The challenge of conscientious writers is to get into the minds of individuals like these – and to help us understand if there is any way to wake them up to the reality of their psychic enslavement. A tall order but an interesting premise for an enlightening human interest article, normally skipped by formulaic political commentary. Ultimately, I suppose this request is to leave it to people like Taib and his henchmen to indulge in hyperbole and emotions; that’s what the BN YBs, cybertroopers and even some of the crooked civil service chiefs are good at – to cover their tracks while they execute their dirty scam. Writers in support of true political reforms should strive to be truthful and to support every assertion with substantive argument, and when writing an article – to assume the readers would be intelligent enough to be skeptical – and to have the curiosity to want to know the many dimensions of the subject of the article. Just a little request to refrain from the understandable urge to engage in sensational writing to combat brazen propaganda by journalists of government-controlled media (in TV and in print). Every time, I read a story like this, I feel very sad. 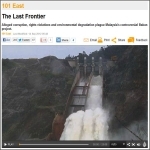 “Scavengers who put Sarawak to shame”? No, I think scavengers put us, the people, to shame because we put Taib and cronies there to be the thieves! 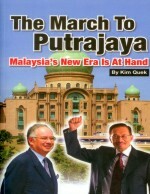 We vote Taib and his cronies to become the government, year in and year out for the last 30 years!! 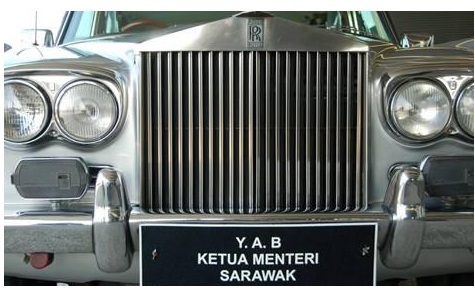 View from the other angle, should we change the title to “Scavengers who put Taib to shame”, since these scavengers are the results of Taib long-term stealing and thieving of Sarawak’s wealth? No! That Taib and his cronies (especially that doggy Abdul Karim) know no shame! Sign of more jobless Sarawakian in their hometown.